By Max D'Amato | March 7, 2018. 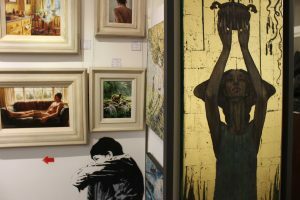 It has been over 10 years since Gallery Zozimus first opened in Dublin 8 and while other galleries on Francis Street have moved on, Zozimus is still going strong. And although it is only two rooms, the gallery boasts the largest ceramics collection in Ireland as well as a diverse collection of paintings. “I’m quite happy here, in 10 years we’ve built up a good collection of clients that come to us for our work, we have repeat business all the time,” says Vincent Kelly, the managing director at Zozimus. The fact that no space in the room is left empty is testimony to Kelly’s statement. Every inch of wall sports a painting or sculpture, from abstracts to landscapes and bronzes to ceramics. Most of the art is of Irish origin and many of these artists now come to Zozimus to promote their work. “In the beginning, we reached out to them but now they come to us because we are well established and fairly well known in Ireland and artist would come to us to show us their portfolios,” explains Kelly. Zozimus host about eight exhibitions a year and are gearing up for their spring exhibition which will feature four international Russian artists; Andrey Demin, Maria Scherbinina, Svetlana Rumak, and Ilya Zomb. In addition to paintings and sculptures, one of the two rooms at Zozimus is entirely devoted to the largest ceramics collection in Ireland. Zozimus remains the last of its kind on Francis Street, which was once defined by galleries offering art work of their own. Now Gallery Zozimus single handedly carries the torch.